After their successful and well-received performance in Davao City last 2017 – Masters of English Rakugo together with special Japanese guest artists return with new laughs and captivating performances. Organized by All Nippon Airways (ANA) in cooperation with Japan Foundation, Manila and the Consulate General of Japan in Davao, Rakugo in English, a Japanese Sit-down Comedy will be staged at the Ballroom of Marco Polo Hotel Davao, C.M. Recto Street, Davao City on Wednesday, January 23, 7:00 pm. This rare cultural performance is open to the public and admission is free. For ticket reservations, online registration is required through https://goo.gl/forms/lCCSdWTsT8PxBjzn2 . Reservations will be accepted until January 21, 2019. Rakugo is a comic storytelling art that has been entertaining the Japanese for over 400 years and is still widely popular in Japan today. The Rakugo storyteller single-handedly creates the humorous side of traditional Japan, playing any number of characters such as Samurai, Geisha, Merchant, Burglar, Child or Drunkard, wearing kimono and sitting on a small cushion using only two small props: a Japanese fan and a hand towel. The audience is encouraged to use their imagination while listening to Rakugo. Currently, it is said that 800 professional Rakugo performers exist in Japan. 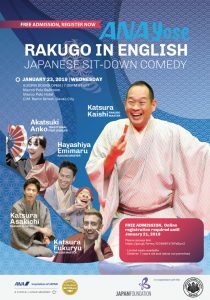 Davaoeños will enjoy Rakugo with Kaishi Katsura, the world’s top performer of English Rakugo, along with fellow Rakugo masters Asakichi Katsura and Fukuryu Katsura. Completing the cast is Hayashiya Emimaru who is famous performing with traditional mask and Yose fans, and Akatsuki Anko who will amaze audience showcasing her foot juggling act. For more information, please access the Japan Foundation, Manila website: www.jfmo.org.ph and www.facebook.com/jfmanila or contact the Consulate General of Japan in Davao at (082) 221-3100.